In any project, a task's Start Date, End Date, Start time, End Time and Duration are calculated based on it's Business Hour configuration. The task Duration is calculated depending on its Start Date and Due Date. A task's Start Date and Due Date will always be considered as a working day, when manually selected, even if it falls on a weekend or a holiday. Example: Task A starts on September 14,2013 (Saturday) and ends on September 15,2013 (Sunday), hence it's task Duration will be 2 days. The Due Date of a task is calculated depending on it's Start Date and Duration. A task's Start Date will always be considered as a working day, when manually selected, even if it falls on a weekend or a holiday. However, it's Due Date is automatically calculated skipping the weekend and holidays based on the Business Hour settings. Example: Task B starts on May 12, 2018 10:00 AM (Saturday) with a Duration of 367 hours, it's Due Date will fall on July 16, 2018 05:00 PM (Monday). 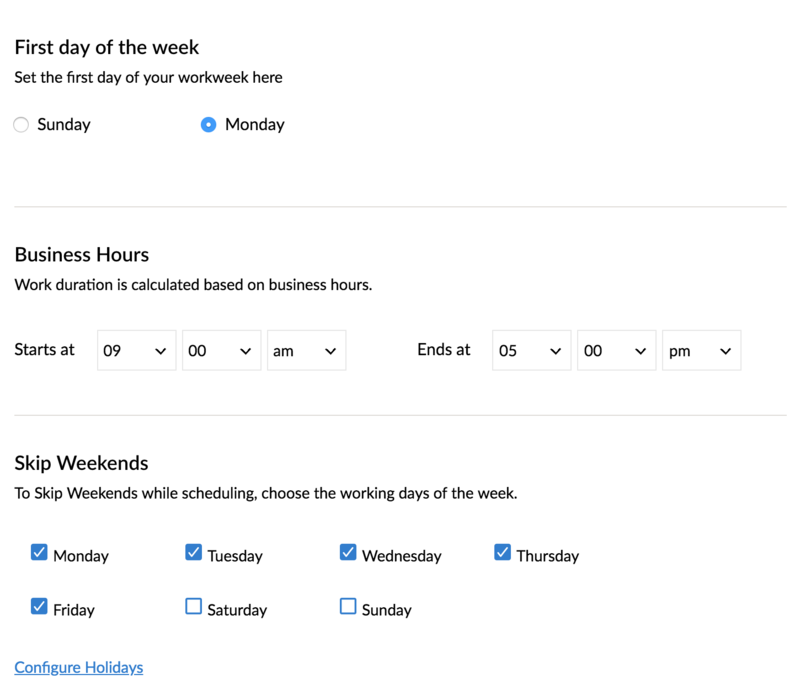 Since the weekends are excluded in the Business Hour settings they will not be considered when calculating the end date. Task duration can be calculated for any combination of working hours assigned to a task. Listed below are some real time task calculations in project management based on different combination of working hours assigned to tasks. Presume the Business Hours setting is configured between 10 am to 6 pm for tasks in an organization. If you set the start time of a task before the scheduled business start time, the task duration is calculated from the start time of the task till the task end time. If Task A starts at 8 am, the working hours of the task will be 5 hours. This is calculated from the start time of the task which falls at 8 am till the end time of the task 1 pm, which adds up to 5 hours. If you set the start time of a task after the scheduled business end time, the task duration is calculated from the start time of the task till end of the day, i.e 12 am. If Task A starts at 8 PM on 9th of July, 2018 and ends at 3:00 PM on 10th of July, the duration is calculated as start time of task to end of day (08:00 PM to 12:00 AM, 4 hours) plus start time of next business day till end time of task (9:00 AM to 03:00 PM, 6 hours) which totals 10 hours. If you set the end time of a task before the scheduled business start time, the task duration is calculated from the day's start time i.e 12 AM till the task's end time. If the end time of Task A is 6 am, the working hours of the task will be 8 hours. This is calculated from the start time of task till end of business day (4:00 PM to 5:00 PM, 1 hour) plus end of day till the task end time (12:00 am to 6:00 am, 6 hours), which adds up to 7 hours. If you set the end time of a task before the scheduled business end time, the task duration is calculated from the scheduled start time till the end time of the task. If the end time of Task A is 3 pm, the working hours of the task will be 6 hours. This is calculated from the scheduled business start time of the task (9 am), till the task end time (3 pm), which adds up to 4 hours.